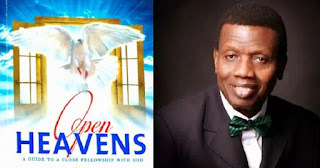 Open Heaven [23 May 2018] Total Submission - Open Heavens Daily Devotional Messages, By Pastor E.A Adeboye. Submission is a humble attitude wherein authority is duly recognized and obedience is willingly rendered without any resistance whatsoever. God commands submission to Himself, to civil authorities and to appoint leaders in His Church (James 4:7, 1st Peter 2:13, Hebrews 13:17). Submission is also commanded in relationship such as marriage (Colossians 3:18). The crux of the message of our Lord Jesus Christ is submission to the will and purpose of God as revealed in His word. In Matthew 7:24-27, He said those who hear the word of God and submit to its authority in obedience can be likened to a wise person who built his or her house upon the rock, and the house survived a terrible storm. In contrast, He compared those who reject the authority of God’s word to a foolish person who built his or her house on sandy soil without strong foundations, and the house was destroyed by storm. Therefore, not being submissive to the word of God, which manifests itself as disobedience, is very costly indeed. I pray that you will receive the grace to submit totally to the will of God concerning your life today in Jesus’ Name.